It's a satyr playing a flute, I don't think it would be hard to come up with a backstory for it. As for Guard, I'm not attached to that either. So is Daishi official? 4 Yes votes and pasted the sanctum review. Kantono Daishi is in finalization (i.e. editing and art). So yes and no. Not yet. There was a change in the C3V/SoV agreement that created an earlier Sanctum review, so that the SoV judges would not test units that the C3V did not find canonical. Daishi has passed that review, but not the final unified fanscape review. While he's such an exception to every rule we have, we still are running him through the same process we do everything else. An off-character personality like Merciful should be justified by its backstory, not the other way around. As it is it's a disjoint in the overall picture. Lynovas by greygnarl and whitestuff has received 5 Nay votes for review (capsocrates, nyys, hivelord, Super Bogue, and Scytale) and is removed from the process. Sundol is bigger, hits harder, and has a wider blast radius than Heroscape's official walking bomb, Deathwalker 7000. And thankfully is more effective. In terms of raw stats, vegietarian18's fire giant isn't all that great. Five attack is certainly enough to do some damage, even though he's limited to one normal attack per activation. Three defense is average (on the weak side of average) but 6 life is pretty nice. The numbers seem ok, but not for 130 points. Crixus provides about the same for a nice 90 points, and of course there's Alastair at 110. Sundol does get some large size immunities and lava resistance, but that doesn't quite match up to the Inspiration Crixus can get from Spartacus or Alastair's very useful Overextend. As one would expect a fair portion of Sundol's worth is in Blaze of Glory, a potentially devastating self-detonation. If things work out just right his blast will damage about 1/3rd of all figures within a huge 5-space radius. While it can only inflict 1 wound, that is enough to obliterate squads. The potential here is huge, but it requires not just good play but a whole lot of luck to get even a moderately destructive blast. It also has the drawback of being as bad for your units as your opponents'. A big firey giant that goes out in a massive blaze? Sweet. Bonds with the Dreadguls? Sure. The only real issue I have with the unit is the figure itself. We already have a fire giant, Shurrak, who doesn't look anything like Sundol. While Sundol looks more like a 4th Ed D&D fire giant than Shurrak does (Shurrak was based on 3rd Ed), the disjoint bugs me. However, according to vegietarian18 he is a Valhallan giant, not a D&D one. Wildly differently-looking creatures with the same Species already exist (Gurei-Oni and the D&D Ogres), so this guy gets a pass. The design is fairly straightforward, though Blaze of Glory is (necessarily) wordy. Basing the radius of the blast on the amount of damage Sundol has taken was an excellent decision; it enhances the risk/reward aspect of the unit and adds a fair bit of tension. Sundol has one obvious use: rush forward, smack some things, and blow up. This is a result of the one basic rule with Sundol: when it's time to blow up, be close to as many enemy figures as possible and far away from your own figures. At this he is pretty good, as he has both the life/defense to survive the run and the attacking power to knock down the stuff in his path. If all goes well, you'll have him standing badly wounded just outside your opponent's starting zone. Of course, things rarely (if ever) go so well. The first problem is that, while 6 life 3 defense is decent, it often doesn't keep him alive for long on a suicide run. On top of that, you don't want to blow Sundol if he has 3 or less wounds. You almost need to push him to the edge, even though there's only a 1 die difference between 5 wounds and death. Result: he often dies before you get a chance to use Blaze of Glory, and you'll find yourself wishing you had put the 130pts elsewhere. The other big problem with the suicide run is that a smart opponent will make it very difficult to do that. Even if you are willing to take a few disengagement attacks (and you should), a small vanguard force can really get in the way and make the run much longer. Pairing him with the Dreadgul Raiders works quite well. The Dreadguls are pretty poor at a disciplined slow-roll due to Beserker Charge and really just want to sprint to the enemy. Your advance Dreadgul force can provide Sundol a little cover and help to clear out some of the rabble your opponent might send to get in his way. Sure, they'll get caught in the blast, but you should have at most three of them in the area at the time. Best of all, you don't have the risk of losing order markers when Sundol dies as your order markers are on the Dreadguls. Playing Sundol in a multiplayer free for all isn't as fun as it sounds. 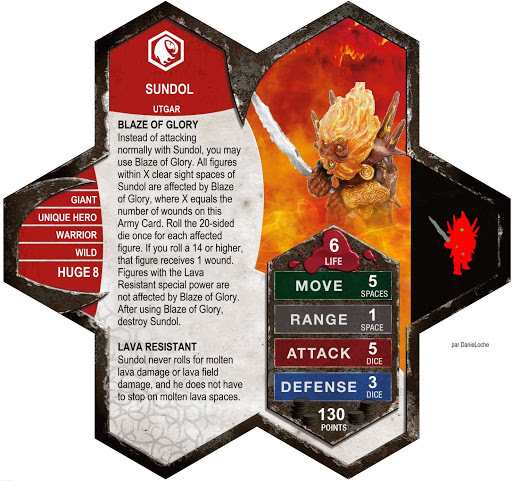 It can be hard enough to time Blaze of Glory when you only have one opponent; when two or more other players put Sundol in their sights he's probably dead. Sundol doesn't work particularly well in other formats either. Formats like Heroes Only, Uniques Only, and dungeon crawls tend to be focused around heroes, which aren't as threatened by Blaze of Glory. Sundol can be fun in Heat of Battle in the right conditions. While it seems like he would provide a nice big heavy-hitter to a Heat of Battle firestorm, in practice a turn with Sundol is rarely ever better than even a single turn with a Fire Elemental, much less three. One can play Sundol more conservatively, mixing him with Dreadguls and other wild heroes and using him mainly for his stats. That will give you more consistent and generally not terrible results. But in that role he's simply overpriced. Overall the price is about right. Sure, he can take out a lot of squaddies with Blaze of Glory (I think my record was 11 Marro Dividers), but he's more likely to fizzle than blaze. 130pts is low enough to take the gamble in the occasional casual draft. Sundol does one thing and does it rather well, if you're lucky. He's certainly exciting to have on the battlefield, whether you're playing with or against him. The tension the unit creates is definitely the funnest thing about the design. While I felt that Sundol was somewhat lacking in strategic versatility (he really only shines as a suicide runner), the tension his presence creates makes up for that. He's far too unreliable to appear in winning tournament armies, but he's fun enough to toss in from time to time. I vote to induct Sundol into the SoV. Last edited by Scytale; May 24th, 2013 at 06:44 PM. Kantono Daishi is in finalization (i.e. editing and art). There are multiple card versions, the OP lists a second name. Is he Kantono Daishi, or Tokanto Daishi (OP)? We are working with Kantono Daishi. I misspell that one less often. So this is were you make all of the submissions to SoV? Sorry if I seem a little..well "new". This is a cool project are you guys just like C3V? I know that you guys don't design any of your finished product this is just a project made up of people who submit their custom ideas for a review and if that passes all of the judges votes then it goes onto latter design right? Sorry for all of the questions, just trying to learn a little about the project. A Heroscaper designs a custom and submits the card here in this thread. The SoV judges vote whether we will review the design or not. If the design passes the SoV vote, there is another vote within C3V to ensure compatibility between the projects. If the design passes the unified fanscape evaluation (ie vote within C3V), then the SoV judges tests the design. Once a SoV judge has sufficiently tested a unit, he will publish his vote here. Once a design has received 4 votes to induct, then the card goes through the C3V Editing and Art process. When the card is finished, I will announce it here and update the SoV display thread.